Whenever I cook chicken it’s always the dark meats such as the thigh and leg that I like best. It’s much more forgiving and less likely to dry out than the breast. I also think that it has a lot more flavour. As Summer looses its shine and Autumn raises its head baked cooking is what I do more of. 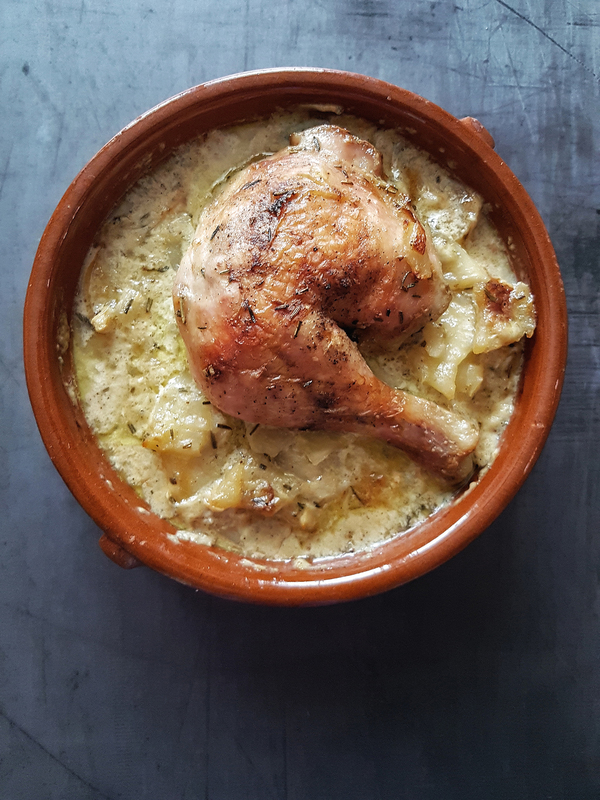 Here is a baked chicken one-pot wonder for you to tuck into. The recipe uses chicken leg quarters on a bed of delicious, creamy and garlicky potatoes. Step 2 Place the chicken pieces into a bowl then add the rosemary, thyme, sherry vinegar, salt and pepper. Rub the ingredients into the chicken then set aside. Step 3 Use two small baking dishes large enough to hold each piece of chicken. Step 4 Layer equal quantities of potatoes, onions and garlic into each dish. Mix the cream and stock together and, again, pour equal amounts into each dish. Step 5 Cover the dishes with foil and bake for 30 minutes. After 30 minutes remove the foil and place the chicken on top of each dish and cook for a further 30 to 40 minutes until cooked.